Why do we do it, so often, with such relish? Go to war, that is. Is it locked into our genetic make-up or is it something learned, which somehow, someday, we may unlearn? Many have asked such questions and many have offered answers though, at altitude, they seem to compose two broad streams, or camps, as Keith Otterbein designates them in his 2004 How War Began. Hawks are those who argue that war existed early in human history; there is no escape. Doves are those who say war arose only when states developed; it is only 5,000 years old, not 2 million or more. His book, is “an attempt to resolve the dispute” which he does by re-examining all the evidence and finding himself with a place in both camps. As it turns out, Otterbein’s question is somewhat different from mine. “How War Began” is an anthropological/archaeological look at paleo-evidence to understand when war began in human time. My question, more properly, is how is it that wars begin, again and again, despite all the terrible experience of it? The answers to both questions overlap greatly, particularly as they involve evolutionary adaptations of the genus homo over time. The answer to “How War Began” is likely also to be an answer to “Why Do They Continue to Begin” – and vice versa. I finished much informed by his archaeological, anthropological, historical research and analysis. Not only are close arguments made for his interpretation of the data, but we get a fair overview of the disputes in the field — how the Hawks put together the puzzle, and how the Doves. His own “resolution” that war (or war-like behavior) rose at two different times in human history is very interesting and, to my eyes, plausible, but it also seems to be a big house built on a remarkably small foundation of evidence. As he says in conclusion, more discoveries may prove or disprove his theory. His organization of the archeological evidence of weapons, signs of human injury and death to others tells him that as long ago as Homo habilis, 2+ mya, rocks have been thrown and clubs yielded, as we now know chimpanzees still do. Markings on bone show scraping by stone to get the meat off, and breaking to get the marrow. It is this “killer ape,” and “hunting hypothesis” that Otterbein calls the Hawk argument: our distant ancestors hunted and killed, therefore we continue to display that inheritance. By showing the evidence, in charts and tables as well as narrative, Otterbein puts himself (partially) in that camp. Predator danger, of course, existed not only in big animals, but in strange creatures that looked somewhat like them — taking game that wasn’t theirs, menacing their livelihood. Fighting followed hunting, followed weaponry, followed organization in a continuing spiral. Add the revenge gene and we have early warfare, the fighters all being non-professional — still having a “day job” of hunting, butchering, carrying and eventually, preserving, the prey. 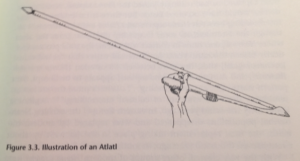 By 40,000 years ago the atlatl (think of a dog ball launcher with a dart instead of a tennis ball) brought a decided advantage, most likely to the now arriving Homo sapiens: the possibility of killing increased, the possibility of being killed decreased. More lethal weapons, bigger game, more warfare. But as we’ve begun to understand recently, man’s first significant impact on his ecological system was the gradual disappearance of big game. As these food sources fell away, Otterbein says, evidence shows that human settlements began to increase in number and to grow in size, especially in river valleys. Hunter-gatherers began to be (small game) hunter-cultivators. With food supply more certain, and big-game less available, the use of heavy weapons fell off, bands and tribes stayed close to their cultivated and stored food. Less wandering, fewer incursions. Fighting fell off and a long era of relative peace began, from about 10,000 BCE to 3,000 BCE as he reads it. As the settlements grew in size, however, hierarchy necessarily formed. Chiefdoms arose in which authority began to be centralized, though not to the degree of states, still to come. Power was held in check by a certain degree of elder-men democracy –not yet a bureaucratic system of retainers– which could support or oppose natural leaders, those with recognized authority. By 3,000 BCE, according to most scholars, minimal chiefdoms, especially in the fertile crescent, but in Asia and South America also, were growing to maximal chiefdoms and then on to states. From large numbers of people, with large numbers of chiefs, evolved an idea of Chief of Chiefs, and more. Top chiefs rose in status and power. Those closest, by kinship or usefulness, formed the top-level of an increasingly frozen hierarchy. Castes and classes formed. An increasing surplus allowed, and demanded, a permanent bureaucracy and a permanent — professional– army. Thus began the second phase of warfare, as Otterbein sees, it, putting him now in agreement with the “Doves” who, in opposition to ideas of the killer ape and man the hunter have generated what is called ‘Developmental Theory’ and ‘World Systems Theory.’ We humans are not “innately” violent, it is claimed; war is a manifestation of the state. Of course, what war is depends a great deal on what we define it as. If war is defined as armed conflict rising from a centralized polity, then there is nothing to prove: before centralization there was no war, by definition. But that leaves a lot of killing, individual and mass — found in the archaeological records — to be explained. Otterbein’s definition is broader, and seems more consistent with human behavior. And I would add, sometimes for the sheer joyous hell of it. Otterbein is analytical in the best way. He sets out in short paragraphs the competing theories of man and war, and then brings his evidence to bear, describing what has been said, and by whom. He shows that theories have gained and lost in explanatory power, and in some cases have risen again, following new evidence. In the mid 1960s, the hunting hypothesis came into favor, with the work of Konrad Lorenz and made popular by Robert Ardrey. It was abandoned later because it had been shown that Australopithecus did not make tools or weapons, that its descendant Homo erectus was a scavenger not a hunter, so by implication, Australopithecus must have also been a scavenger, not a hunter of, but a prey for, large carnivores. Lately, however, the hunting hypothesis has been revived, especially with the observations of Jane Goodall and others that bands of chimp regularly raid, threaten and even kill each other, indeed have been observed to cannibalize their own leader. In a very interesting paragraph which I wish he had pursued more, he takes up the famous comparison between the fighting chimpanzees, patri-local, and their near cousins, the peaceful, matri-local, bonobos. Chimpanzees, wherever they exist, have to compete against other primates for territory and food, and defend against large carnivores. Bonobos, in their particular part of Africa a) have no primate competitors, and b) have far fewer predators. Rather than male=violent, female=pacific, the crux of the matter is evolutionary pressure. Where there is higher strife and danger, aggression and male bonding are rewarded; those genes have an advantage; evolution. Where there is less pressure, aggression and male bonding are not as highly rewarded and evolution can take another path. He gives generous credit to those from whom he has learned, much in the style of Darwin’s exemplary acknowledgement to others in The Origin of Species. We find where Darwin, Malinowski and Lorenz, Ardrey and Charles Tilley are in relation to each other and to the on-going analysis of human life and war. For some readers, the thickets of anthropology may be too much for their liking. For me it was a worthwhile refresher of names and researchers I have long read, and reasoned along with. Not only do we learn about the theories and their authors, but we get a fair warning in this highly politicized world, that even experts may interpret their data to fit their own belief systems; that Hawks on the theory of man and war may well be Hawks in current politics; that those with a strong bias against war may find that early man was quite peaceful. I particularly appreciate his fair and extensive recapitulation of opposing positions, including description of what would falsify his theory. e.g “If settled gatherers… precursors of early agriculturalists, are found in some instances to have engaged in warfare, it would suggest that warfare did not decline after the extinction of large animals.” He also points to what he once thought and no longer does, and tells us why he changed — a rare quality in any one, much less a scholar with reputation and position to defend. Though I learned much from How War Began, it came with caution. Sentences such as “By 250,000 years ago, early humans had probably invented methods for hafting stone points on wooden shafts” and “The practice of mounting a bone point onto a shaft may also have been developed at this time,” give readers fair warning. Supposition and generalization are necessary, but potentially misleading. The evidence, though wide by archaeological standards, and much increased in recent decades, is still precious little. At least one claim he made, at publication in 2004, that there is no evidence of interbreeding between Homo sapiens and Homo neanderthalensis, is now known to be false. We all, apparently, have some 2-3% of neanderthal genes. In general the problem of which statistic to use, and what may fairly calculated from them, is a vexed question. The standard measure of mortality is deaths per 1,000 of population as measured at mid-year; the standard for homicide in cities seems to be deaths per 100,000. Older populations will, ordinarily, have a higher death rate than younger, so looking at a table of death-rates may be very misleading. Nation A has a higher death rate than Nation B. Does that mean A fights more, or that it has more elders than A? Battle deaths are different again. If they are measured per 1,000, we need to know over what period of time? When I looked at deaths estimated, and conclusions drawn, by Otterbein and by Steven Pinker in his massive, and hotly disputed book “The Better Angels of Our Nature,” I found numbers for similar time periods leading to different conclusions as to peaceful or warlike. It didn’t take me long to realize it would take me too long to understand the numbers well enough to come to my own conclusions. And, as I said earlier, the actual evidence, from which large claims jump, seem to be to be precarious — except as thoughtful speculation about who we are and where we came from. Let the scholars go at it, and be ready to keep on changing as the data determines. The last thing I’ll say about this book, which greatly rewarded the time I spent on it, is that it is more than unusual for a serious academic study to include in the opening pages, a picture of the author as a child, in feathered headband with a bow and arrow. It may be that Otterbein’s interest is anchored in his childhood, as he tells us, and knowing that may make him seem less of an ivory-tower nerd, but it is unusual! A summary of Lawrence Keeley’s review of Otterbein’s book. It was Otterbein’s review of Keeley, with whom he disagrees, that set him on the road to his book. Richard Wrangham’s Catching Fire, reviewed here and here — not about war but about fire, cooking, change in diet and the possible evolution from homo habilis to homo sapiens, and the original division of labor between the sexes — cooking.